So it's the first day of Spring. The Vernal Equinox. The death of Winter, the rebirth of life and all things warm. And I was so into it. We've been waiting for months to be liberated from the icy shackles of this, the Longest Winter Ever. To mark this most anticipated of days, I'd prepared a blog post on gardening, the uber-chic pastime of 2009--even the Obamas are doing it. I was prepared to expound on the therapeutic benefits of reconnecting with the earth, of cultivating life, and of nourishing your family in a more natural and holistic way. Yes, I was going to blog at length about these things today. So now I'm kind of too bummed out to pontificate on the joys of Springtime gardening. I will, however, share some good gardening resources with you. The National Gardening Association. Seed swaps, pest control advice and how-to videos. One-stop shopping for the expert and the novice alike. Second Nature, by Michael Pollan, a self-proclaimed "child of Thoreau." 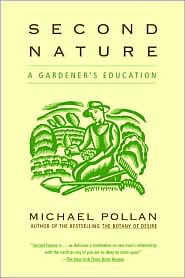 This book inspires the gardener trapped inside. Daffodil Planter, gardening with a sense of humor. The Edible Schoolyard, by famed organic chef Alice Waters. Read this book and get inspired to suggest changes at school, too. Any gardening resources you like, Mamas? Please share! Thanks for the link to the white house garden! That is just too cool! Love it! Oh, and we are supposed to get snow here next week! Pah!